Will Devlin, chef owner of The Small Holding, a kitchen and farm on a country lane in the pretty village of Kilndown on the Kent and East Sussex borders, has created a Farm and Forage day for guests to experience a day in the life of the restaurant. Launching on Wednesday 1 May, the day will start with coffee and homemade pastries before pulling on wellies for a walk around the farm to learn more about the 200 varieties of fruit and vegetables being grown on site for the restaurant. After feeding the pigs and chickens, guests will venture down the lane to the woods and fields to go foraging with Will to find what’s in season including wild garlic, blackberries, elderflower, cobnuts, mushrooms and wild strawberries. On returning to The Small Holding, guests will be greeted with a glass of awarding-winning Squerryes’ English sparkling wine before being seated for a 5 course t tasting menu. Launching on 1 May, the Farm and Forage days are only available on Wednesday and Thursdays throughout the Summer from May until 29 August, priced £145 per person, including a 5-course lunch and arrival drink and a goody bag with seasonal treats to take home. Bookings can be made direct via www.thesmallholding.restaurant or by calling the restaurant on 01892 890 105. Greensand Ridge, a craft-distillery near Shipbourne, in the Weald of Kent, has achieved one of its original green goals by becoming carbon neutral, the first UK distillery to do so. The Kent-based distillery was launched in 2015 with the aim of being ultra-low impact on the environment while also having a positive impact by using surplus produce from local farmers, such as plums and apples, which the supermarkets won’t take. The assessment makes up part of the distillery’s inaugural Sustainability Report which details all the work that is done at Greensand Ridge to minimise the environmental footprint through schemes such as renewable power, heat recovery systems, removing plastics and being chemical free. Now in its fourth year, Greensand Ridge took some time to achieve carbon neutrality. “The regulations demand a significant ongoing investment in time and resources and we needed to be well established before we undertook the work. Hopefully, that work can be a template for other businesses in the industry”. Greensand Ridge’s 2019 Sustainability report is available online at www.greensanddistillery.com, and spirits can be purchased directly, from fine food outlets or by the trade directly from the distillery or through distributors. Greensand Ridge Distillery launched in July 2015 with the mission to reduce food waste at the farm gate by fermenting and distilling quality fruit that supermarkets won’t take and combining these with local botanicals such as cobnuts, gorse and bay to make a range of unique spirits. Powered by 100% renewable electricity and with a zero target for chemical use and non-recyclable waste, Greensand Ridge Distillery is a truly sustainable business. Gin lovers can visit the distillery, set in a beautiful location overlooking the Weald of Kent, just outside the village of Shipbourne, as part of a Gin Experience, where visitors can create their own full bottle of gin to take away with them. The business is run Will Edge who worked in IT, marketing and finance before he undertook a Masters’ Degree in Brewing & Distilling in order to return home to Kent and set about turning his love of spirits and craft cider-making into a livelihood. Tom Griffiths, chef owner of Flank, London is cooking a masterclass event with Big Green Egg at River Cottage on 17 April. Serving up his modern take on British food - expect nose to tail dishes cooked over fire on the Big Green Egg. Tom is cooking with Big Green Egg chef Ross Anderson and River Cottage chef Andy Tyrell. I’m delighted that Will Devlin, chef owner of The Small Holding, Kilndown is a new client at The Dining Room. Will Devlin, 30, is the chef owner of The Small Holding, a kitchen and farm on a country lane in the village of Kilndown on the Kent and East Sussex borders. The 26-cover restaurant has been named as one of the best restaurants in Kent at the Taste of Kent Awards and is set in one acre of land, permitting a unique connection between farm and table. Growing, foraging and cooking the best ingredients is at the core of The Small Holding, with daily changing menus, using home-reared and home-grown ingredients from the farm, which is less than 10ft from the kitchen. The ten-course Full Acre menu offers the diner a full experience of the farm and kitchen starting with home-made sourdough and butter, made on site with the rich yellow cream from a local Guernsey here. This year The Small Holding is growing nearly 200 varieties of vegetables and fruits. During the peak growing months, the raised beds and poly tunnels are full of lettuces, chard, beans and legumes, tomatoes, courgettes, raspberries, gooseberries and blackcurrants, plus the foraged bounty from the woods over the lane from the restaurant which offers wood sorrel, blackberries, wild garlic, chestnuts and mushrooms. Rare breed Berkshire pigs, chickens and ducks roam the farm and there are plans this year for cows and goats. The five-course Half Acre menu offers a sample of the Full Acre menu, plus vegetarian and vegan Half and Full Acre menus with wine and non-alcoholic flight pairings. Sample dishes from the March 2019 menu includes Nettle, Garlic, Black pudding; Skate, Dandelion, Sorrel and for pudding Gypsy Tart, Rhubarb, Cream. Join the team at the Garden Kitchen to create a small batch craft gin made with botanicals foraged around The Beacon. 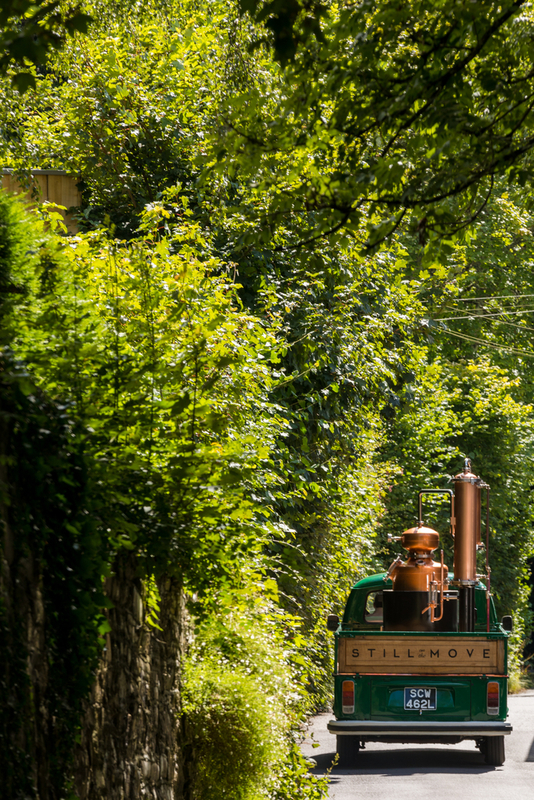 On 7 June, Cosmo Caddy, creator of Still on the Move, the UK’s first ever mobile gin distiller is hosting a gin workshop at The Beacon. Affectionately known as ‘Ginny’, the authentic copper still, on a vintage 1937 VW truck, tours the country, packed full of different spices and botanicals, spreading the joy of gin. The Garden Lane G&T is a favourite at The Beacon so the chance to create our own small-batch premium gin is the best way to experiment with flavours and botanicals to create something totally unique. All gin must have a dominant flavour of juniper, but the team wanted to create not just a Kent gin, but something that has flavours and aromas specific to The Beacon in the 17 acres of woods, that surround the restaurant. The Beacon's creation is Mother’s Ruin. On the palate, it is a strong, well-rounded and balanced gin with hints of citrus, green cardamom and coriander seed with earthy undertones complimented by garden botanicals foraged in the grounds including wild fennel and wood sorrel. At the workshop, enjoy a Garden Lane G&T with platters of bites and nibbles and listen to Cosmo talk about the craft of distilling gin and show how to use fresh and dried botanicals. The house serve at The Beacon is with a slice of grapefruit, juniper berries and a few wood sorrel leaves, served over fresh ice and Fever Tree tonic water. A bottle of Mother’s Ruin distilled on the day will be available to buy at the special price of £30 (normal price £35). This is a FREE event. There are limited places available so please email david@illbemother.co.uk to register your place.